Turkey leftovers! Use up the last of that turkey in this one pot stew...this is epic comfort food. 1. In a large oven safe pot or Dutch oven, preferably with low sides, saute the shallots, mushrooms, carrot, and celery in the olive oil until soft, or about 10 minutes. If you want to add the extra thyme, now is a good...time...to do it. 2. Add the white wine, cook until mostly evaporated, about 2 more minutes. Then add the Tbsp of flour, give it a stir, and pour in the stock. Simmer until mixture starts to thicken, about 3-5 minutes if your stock is already warm. 3. Add shredded turkey, frozen peas, and salt and pepper. Turn heat off stove and pre-heat oven to 425. 4. In a food processor combine the flour, butter, and chopped herbs, and pulse about 5 times. Then begin adding milk gradually, pulsing only enough to combine. When the milk is gone you should have a soft dough. 5. Using a spoon, scoop the dough and form into little balls and place them gently on top of the stew. You should end up with about 20. 6. 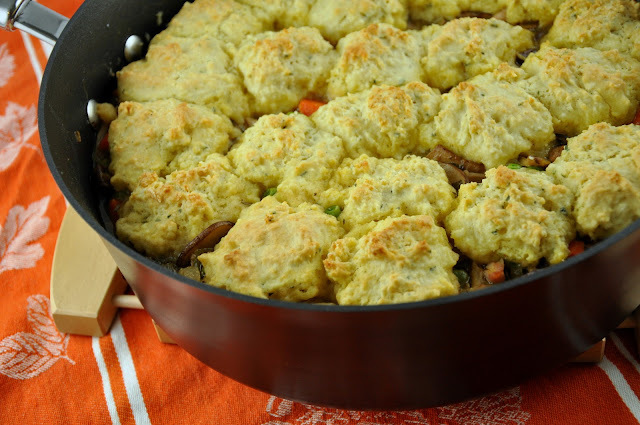 Bake the dish for 25 minutes, turning on the broiler for the last 1-2 minutes to brown the tops of the biscuits. Let it rest a few minutes after taking it out of the oven. *If you don't have self-rising flour on hand, you can substitute all-purpose flour. Just be sure to add 1 tsp baking powder, ½ tsp salt, and ¼ tsp baking soda for every cup of all purpose flour used. 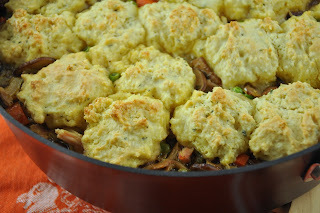 I have gotta try this recipe...its been a long time since i had turkey and biscuits,..thanks for sharing this Nat!